Left: Christa at NVRDC in April 2014; Right: Christa at work in Chicago in March 2018. NVRDC will soon be celebrating 6 years of providing impactful services to crime victims in DC! In honor of the many fantastic, inspiring, and hardworking individuals we have worked alongside since 2012, we’re kicking off a new blog series: “Where Are They Now? : NVRDC Edition”! We can’t think of a better person to start with than former advocate Christa Heilman. NVRDC: Hi Christa! Thanks for talking to us about where life has taken you after working at NVRDC. Can you tell us when you were at NVRDC and what your role was? Christa Heilman (CH): Hi, thanks so much for inviting me! I started with NVRDC shortly after the organization was formed, and just before NVRDC become responsible for the sexual assault hospital response program in October 2012. I was a Victim Advocate and Case Manager for the first year, and took on the role of developing and managing the Community Outreach and Education department while continuing to serve as an advocate through August 2014. NVRDC: Do you have any favorite memories from your time at NVRDC? CH: I would have to say by far my favorite thing about working at NVRDC was the people. I was incredibly fortunate to meet amazing people through our community and government partners, our clients, the universities, the DCFNE nurses, MPD, NVRDC leadership, and of course, my co-workers. The first year, the case managers (and there were only four of us!) baked holiday cookies for all our key partners to thank them for their collaboration and support [editor’s note: this tradition continues to this day!]. Both NVRDC and its partnerships have grown immensely. 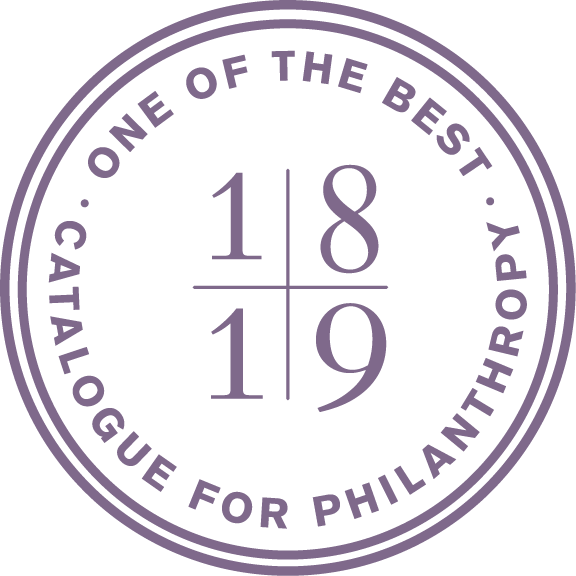 It demonstrates the importance of the work and the power of ongoing collaboration. I feel really lucky that I was there in the beginning and I’m so proud and excited to see how much it has grown. NVRDC: Are there any accomplishments that stick with you to this day? CH: One accomplishment that sticks out in my mind was preparing for and attending in support of my client for the “Sexual Assault Victims’ Right Amendment Act of 2013.” I was in awe of, and so proud of my client and the many people who testified to make this Act pass. The Act was instrumental for victim services and ensuring transparency of information for the victim throughout the case investigation. NVRDC: We’d love to know more about your current role. Where are you working? CH: I work at Blue Cross Blue Shield of Illinois in Product Development. I develop products that focus on preventive health and wellness for Large Group Employers. So for example, an employer may offer a wellness program to their employees and if the employee completes a wellness activity (i.e. participates in a health screening, walks 10,000 steps every day for a month, etc.) they would get a reward (i.e. lower premium, a fitbit, gift card, etc.). I work on developing and implementing those wellness programs. Former NVRDC case manager, Nicole, and Christa doing outreach in 2014. NVRDC: In what ways did your experience at NVRDC influence and prepare you for the next steps in your career? CH: I left NVRDC to pursue a Master in Public Health. After working in direct services for several years, I wanted to gain a better understanding about the systems that directly impact a person’s health, wellness, and safety. From my experience at NVRDC, I learned a great deal about the importance of setting up a system of support through care coordination, and the deep impact multiple structures can have on a person’s wellbeing and health outcomes. NVRDC first exposed me to the research behind the neurobiology of sexual assault, revictimization, and the brain and body’s response to trauma that I continued to build from in my Grad School research and professionally. After graduating, I worked for a year as a healthcare consultant in hospital systems throughout the U.S., before moving to my current job at Blue Cross Blue Shield. NVRDC instilled a ‘people first’ mentality in me. Behind every project I’m on and every future product I’m developing, it is all for the goal of impacting and improving people’s health—and most importantly, supporting them in defining what this means, and how they can accomplish it. "NVRDC instilled a ‘people first’ mentality in me. I’m developing, it is all for the goal of impacting and improving people’s health..."
NVRDC: Are there things you miss about DC? CH: Oh yes! I now live in Chicago and love the city, but I really miss how in DC, it is a short drive to National Parks with great hiking. You drive hours outside of Chicago and it’s still flat as a pancake, land of corn fields. I really miss being able to walk to Rock Creek Park and the short drive to the Billy Goat Trail at Great Falls. I also miss my coworkers. I was so lucky to work with some of the most brilliant, compassionate, and driven people, who I was fortunate to grow into friendships. NVRDC: Give us some fun facts about your life outside of work? CH: I am always trying to find the work/life balance, but I am a firm believer in prioritizing my relationships and hobbies. I became an Aunt last year and it is so fun! My niece is in the DC area, so not only do I get to plan trips to see her and how much she’s grown, I also get to visit friends and often stop by the NVRDC office. I also love eating and drinking, and Chicago is a great place for it! There’s always a new brewery popping up and a restaurant to try. I really enjoy the diversity of the city and this can be seen through the vast options of food. Indian, Thai, Caribbean, Puerto Rican, Mexican—whatever you want, you can find it here! NVRDC: Anything else you want to share with our followers? CH: Just a huge thank you to the people at NVRDC and your followers. Much of who I am and where I am today is because of all of you. 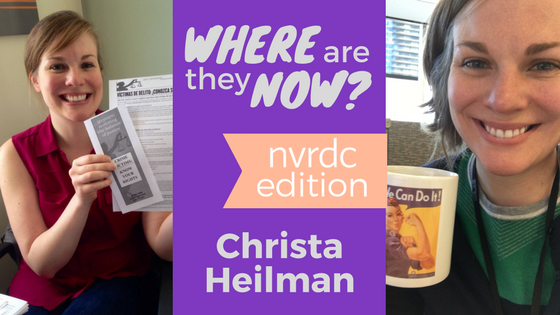 NVRDC: Thank you so much for participating and for being the first interviewee in our new “Where Are They Now?” series! Left to right: Christa, former NVRDC case manager, Kari, and Director of Advocacy & Case Management, Lindsey, in 2013.